Stop press: New chalkstream fly fishing water for 2012! Upper river Itchen. (The Shallows and Main River beats) Superb wild trout fishing on the upper river Itchen. Most of the beats require wading as it is very traditionally managed. 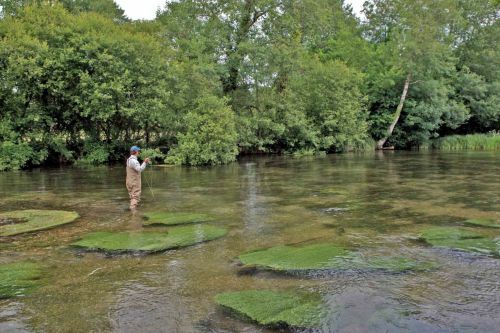 We have two generous beats on the main river Itchen that offer anglers that ‘lost in time’ private estate, wild trout fishing that is so rare these days. These beats will accommodate one or two rods comfortably. River Alre (Itchen tributary, Drove Lane beat). This beat is the most downstream stretch of the Alre at the confluence of the rivers Alre and Cheriton Brook forming the main river Itchen. Superb wild trout fishing on private estate water. Only 2 days each week are fished. Well rested and traditionally managed wild trout water. Candover Brook (Itchen tributary, upper and lower Candover beats). The Candover is a main tributary of the upper Itchen. A small wild trout stream that offers tricky but very rewarding wild trout fishing in pristine water. A single rod beat with mown riverbanks. Elm Stream (Itchen carrier). The Elm stream is a beautiful river Itchen carrier stream running parallel with the main river at a braided section. All wild trout, wading required. Traditionally managed and well rested wild trout water. A single rod beat that requires wading. Bossington on the river Test. Bossington (middle Test). Also part of British aviation history, Bossington is in ownership of the Fairey family, makers of the Fairey Swordfish aeroplane. This famous private estate fishing is immediately below the hallowed Houghton Club water and offers a super mix of main river Test and carriers. Excellent facilities and full time keepers. The House Beat has the beautiful back drop of the Manor House and lawns. Bossington, the Wallop Brook (Test tributary). A beautiful river Test tributary. Wild trout and stocked brown trout. Wading required. We are very proud to say we have over 60 beats in our portfolio, on 20 or so named chalk streams. I lost count. As an estimate around a dozen Grayling and a dozen Brown Trout, but probably a lot more. Had one really large Grayling. My biggest since fishing the Test at Wherwell last November. In its prime in a few months would be 3Lb+. Had one even larger shake the hook out – Language was appalling. Very long and fine fluorocarbon leader. My Marryat 10 foot number 4 rod is superb for this. Very slow wading, waded the beat twice during the day. I used the induced take as per Frank Sawyer & Olive Kite. Had two young ramblers wandering down the path at one stage. Pointed out to them they were on private land and they were upsetting my fishing. They apologised and moved on.